YOUR SEARCH FOR A PERFECT NURSERY ORGANIZER IS OVER! 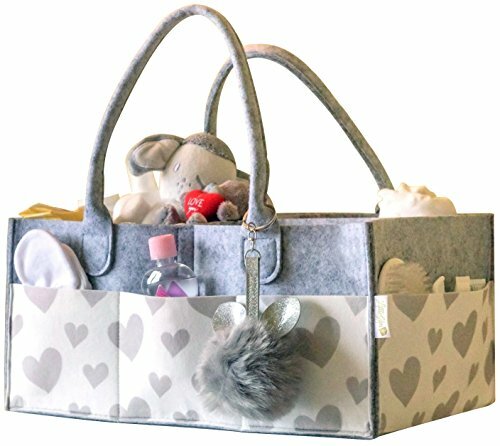 INTRODUCING LittleGem4U Portable Baby Diaper Caddy! NO MORE MESS, NO MORE FUSS - Our spacious and portable diaper caddy can keep all your baby essentials in one place. You can take it everywhere in the house or out. JUST LIKE MOMs, SOFT BUT STRONG - Many similar products are made of thin felts which tend to collapse when not fully filled-up. Our nursery organizer uses the highest quality and extra thick felt materials so it retains perfect shape even when empty. And it is still very lightweight with soft-to-touch edges thanks to high standard craftsmanship and quality control. WHATEVER YOUR BABY NEEDS, IT’S IN - With a large and practical size 15’x10’x7’ inches, this organizer can easily accommodate diapers in all sizes, full-pack wipes, cream, powder, bibs, pacifiers, teethers, bottles, breast pump, toys, blankets, clothes and more. You can remove 1 or both dividers to create larger rooms to suit your baby's needs. FOR ANYONE, ANYWHERE, ANY PURPOSE - Color neutral does not equal to dull and boring. With beautiful silk-print patterns, our diaper caddy will compliment and lighten up any room or anyone carrying it. After your baby grows up, it can be used by girls boys to organize crafts, toys and books. Take your baby out by car? Use it as a great car storage organizer. It is also a popular baby shower gift! YOUR SATISFACTION IS GUARANTEED - We’re extremely confident about the quality of our baby diaper caddy. If it won’t meet your expectations, we will refund your money back in full! GET THIS FANTASTIC MULTI-FUNCTIONAL BABY DIAPER CADDY AND PORTABLE TRAVEL NURSERY ORGANIZER TODAY!  JUST LIKE MOM, SOFT BUT STRONG - While other diaper caddies are too flimsy, too small, too dull or too bulky, Littlegem4U premium diaper organizer is made of extra thick high quality felt materials so it is super sturdy and retains perfect shape even when empty. With unique and stylish silk-printing patterns, this portable and foldable large nursery organizer is lightweight with soft-to-touch edges thanks to high standard craftsmanship and quality control. 珞 NO MORE MESS, NO MORE FUSS - No more running out of diapers and wipes, or looking for that missing pacifier or lovey, in the middle of a diaper change with a crying baby kicking around! Our diaper caddy organizer keeps all baby essentials not just organized in one place but also can be effortlessly tote around your house and outside, avoiding diaper changing drama, saving you time and keeping your little one calm and happy.  TRULY MULTI-PURPOSE - This multi-purpose caddy organizer goes far beyond diapering age. It can be used by little girls and boys to organize toys, books, crafts and accessories. It can be used by adults to keep everyday essentials in bedrooms or bathrooms. It has become a trendy baby shower gift and baby registry must haves. Just 'Grab and Go' as a baby car organizer or a picnic basket. ❤️️ YOUR SATISFACTION IS GUARANTEED - At Littlegem4U, we believe life should not always be hard, even if you juggle a full-time job and a full-on household. Our aim is to make everyday life easier and happier for modern families. We are real parents and we develop every product from our own experiences. Our kids are perfect product testers! So we're extremely confident about the quality of our nursery organizers which are backed by hassle free money back guarantee and 1 year defect warranty!  STAY ORGANIZED IN STYLE - With a large and practical size 15'x10'x7', this baby diaper caddy can easily fit in 3 full-size wipes, a changing mat, large amount of diapers, spare clothes, toys, breast pump etc. 8 external pockets are perfect for smaller items such as pacifiers, creams, bibs, nail clipper, even your phone and tablet. Dividers can be removed to create even larger spaces. The stylish look with elegant silk-printed design compliments any room decor. If you have any questions about this product by Littlegem4U, contact us by completing and submitting the form below. If you are looking for a specif part number, please include it with your message.